Olympic Torch Draws Heat in San Francisco San Francisco braces for big street protests as the Olympic torch makes its way through the city. Demonstrators are angry over China's recent dealings with Tibet. The Bay Area is home for scores of Tibetan exiles. San Francisco braces for big street protests as the Olympic torch makes its way through the city. Demonstrators are angry over China's recent dealings with Tibet. The Bay Area is home for scores of Tibetan exiles. And I'm Robert Siegel. The Olympic torch arrived in San Francisco today for its only U.S. appearance. But the event turned into a game of cat and mouse, with police sneaking the torch past thousands of anti-China protesters who had lined the scheduled parade route earlier in the day. SIEGEL: It was a bizarre twist: evasive action for the Olympic flame on its symbolic journey to the Beijing summer games. NPR's Richard Gonzales has spent the day on the streets of San Francisco, talking with some of the protesters. And he joins us now with the latest. Richard, first they cut the six-mile relay route in half, and then the torch went into hiding for about half an hour. What happened? RICHARD GONZALES: That's correct, Robert. The first runner took the torch into a nearby warehouse at the starting point on the southern end of downtown. It disappeared for about 30 minutes, as you say, before it was apparently taken in a convoy of vans to a point about 1 mile inland, away from the original route and away from the protesters and all of the media. The latest word now is that the torch is on its way out of San Francisco. So, apparently, San Francisco police were successful in keeping the torch away from the demonstrations, and also confrontations between Tibetan exiles and their supporters, and Chinese and Chinese counterprotesters that were gathered at the foot of Market Street. Let's hear a little bit of those confrontations. GONZALEZ: So as you can hear, it was pretty angry, very noisy and very raucous, but there were no fisticuffs, at least none in the area that we were able to monitor. SIEGEL: But, thousands of demonstrators had lined what was supposed to have been the relay route. How did they react when the torch started bypassing them? GONZALES: Well, there was a great deal of disappointment here, Robert. People began to drift away from this demonstration. Some people ran off to the other side of town to try to catch up with the torch and hold their protests there. But others stayed at Justin Herman Plaza at the foot of Market Street to rally in their place. We have both pro-Chinese and pro-Tibet protesters trying to occupy largely the same plaza. SIEGEL: Now, San Francisco has a very large Chinese-American population. And in fact, it's also home to thousands of Tibetans, many of them exiles. How was that a factor in today's demonstrations? GONZALES: Well, Chinese Americans turned out in force today. Many say that they may not support the policies of the Chinese government, but they also say that they have been offended by the protests. They feel that the protesters did not distinguish between the Chinese people and the Chinese government. And on the other hand, you have a large cadre of Tibetan exiles. And for them, this was their day to bring global attention to their cause. I want to play for you the reaction of a young woman. Her name is Lun Tie Tong(ph). I asked her about the importance of this protest, especially to the elders in the Tibetan exile community. Ms. LUN TIE TONG (Protester): People inside are saying that they'd rather die speaking out than go on their knees. And I think that all we can do is be in the streets. You know, it's not about the Olympics. It's not about athletes. It's not about torchbearers. It's about a nation that's being killed, not dying, but being killed. GONZALES: A very emotional response. And that was a kind of thing we heard from Tibetan exiles all day long here in San Francisco. SIEGEL: Richard, San Francisco obviously wanted to avoid a repeat of what happened in London and Paris when the torch went through those cities. Do you got the sense that in San Francisco, the city fathers, the mayor regards this as having been a success? GONZALES: I suspect so. The people who saw the torch running through the streets of San Francisco were everyday people who were not protesters, people in downtown who were completely surprised by the torch coming through there and certainly did not expect to see it happen. SIEGEL: Okay. That's NPR's Richard Gonzales, reporting from the Olympic torch relay route on the streets of San Francisco. 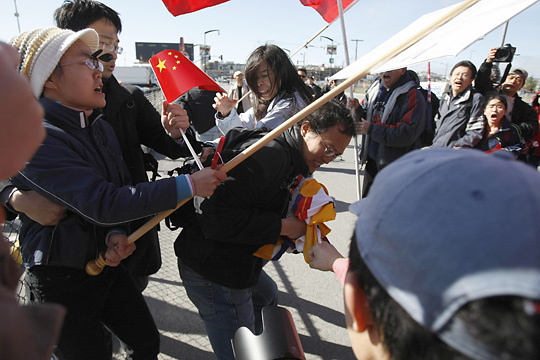 A man carrying a Tibetan flag is attacked by pro-China supporters awaiting the start of the Olympic torch relay on Wednesday in San Francisco. The Olympic torch relay got off to a chaotic start in San Francisco on Wednesday, when the torchbearer was routed away from thousands who turned out to cheer and protest the flame's journey to Beijing. The flame disappeared from view for about 30 minutes when the first torchbearer ran into a warehouse near the waterfront after the opening ceremony. It reappeared about a mile from its expected location. Before the opening ceremony, San Francisco police had announced the relay's six-mile route would be cut in half. They did not offer an immediate explanation, but city officials had warned they might shorten the route for security reasons. Crowds began to gather early in the day at San Francisco's McCovey Cove, where the Olympic torch was scheduled to make its North American debut. The torch's circuitous travel around the globe has already has been marked by demonstrations against China's policies toward Tibet and Sudan, and more demonstrations are expected worldwide before it reaches the Summer Games. San Francisco officials said police officers were backed up by other Bay Area police departments, the California Highway Patrol and the FBI in an effort to keep Olympic runners and bystanders safe, while protecting the protesters' right to free speech. Nearly 80 torchbearers had prepared to carry the Olympic flame along the route past hordes of protesters and counterprotesters. Ultramarathon runner Dean Karnazes, who was to be one of the torch runners, said the city had taken the proper precautions to protect runners. Karnazes said city officials reassured participants that law enforcement would work with the State Department and international authorities to avoid a repeat of the chaotic demonstrations in Paris and London. He said the actual relay route would be kept secret as long as possible. Violent protests in Paris and London prompted several San Francisco torchbearers to drop out. San Francisco is the only stop for the torch in North America. The city was chosen to host the relay, in part, because of its large Chinese-American population. 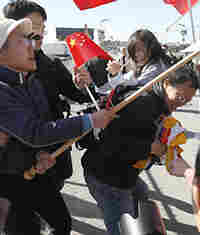 Many San Francisco residents have asked for calm and expressed their pride that China was chosen to host the Olympics. Chinese officials have dismissed previous demonstrations as the actions of a few who are trying to hijack a historical event for their own purposes. The International Olympic Committee is considering whether to cancel the rest of the torch's world tour.